Exploring common relationship themes and struggles through the lens of a young couple finding their way through sexual identities and polyamory, Vanishing Twins expertly uses ballet metaphors and the blurred lines between twins and soul-mates to walk us through a personal and astonishing story. While Leah Dieterich’s writing is precisely executed and peppered with gorgeous prose, it’s the forthrightness and integrity of her words that really make an impact. There’s a kind of ache – a searching – to Vanishing Twins that brings a sense of fluency while simultaneously being wholly disorienting. The plot moves fast, focusing more on the vast theme of self-discovery rather than the details of a too-linear storyline; essentially skipping to the good stuff and getting to the point. Vanishing Twins is a stark commentary on social norms and expectations, choosing to fully delve into these subjects as a whole rather than focus on singular experience. The narrator’s journey is full of well-meaning, yet uncertain behaviors that lend themselves to an intriguing read, despite being habitually insular. Dieterich’s detailed research on absorbed twins and expansive knowledge of ballet, art and philosophy pepper the plot, giving symbolism and much deeper meaning to otherwise straightforward themes. This academic and slightly commanding technique could feel overwrought if it weren’t executed so effortlessly and with so much poise. 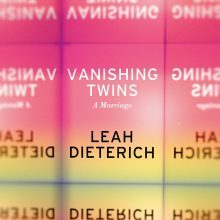 The topics in Vanishing Twins can certainly be polarizing in the wrong hands, but Dieterich handles them with such grace and studiousness that, whether you agree with her or not, it’s impossible not to admire her dedication to finding the answers to such emotionally-driven fare. At times, Vanishing Twins almost reads like a captivating research paper – citing sources, backing up theories and drawing surprising connections – yet it never loses its delicate touch and expressive poignancy. In the end, it’s a commentary on individuality and self-identity while maintaining a marriage, but it’s also a reflection on love and its boundaries and limits. Dieterich has certainly delivered a timely and vital novel, but rather than get caught up in its seriousness, she presents a stunning and fascinating narrative that delivers a startlingly touching blow.